The charm of traditional wood fence enclosures define the character of our homes and relationships with our neighbors. Let the experts at Budget Fence and Gate Systems find a fence to suit your style, your property, and your Budget. You can’t beat the look of a naturally beautiful fencing material, custom built by our highly skilled and experienced craftsman installers. There are many practical uses for a fence: to gain privacy, safely corral kids and pets, block wind and noise, and prevent unsupervised dips in a swimming pool. 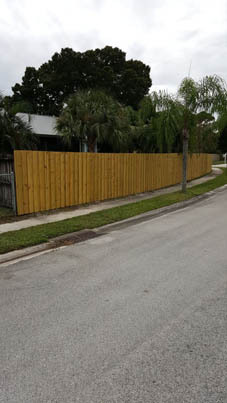 But the right fence also makes a strong aesthetic statement, dramatically improving a home’s curb appeal. Going back 400 years, the favorite residential fencing material in this country has always been wood. In 2007 alone, Americans put up more than 59,000 miles of it, enough to circle the globe twice, and then some. So why do so many homeowners choose wood fencing? It’s naturally beautiful, inexpensive and lightweight to be sure. The main reason is that a wood fence can easily be shaped to give properties character and individuality. You can choose from dozens of styles, including linear post-and –rail and criss crossing lattice as well as a myriad of picket patterns and post cap designs. You can stain the wood to make it pop out or recede from the landscape as either a vibrant or subtle frame for what’s behind it. Our highly skilled, trained, and experienced fence installers can meet with you at the commencement of your installation to go over specific details you’re looking to accomplish. 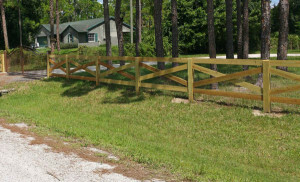 Each of our custom made wooden fence solutions are constructed piece by piece on the job site. Constructing fencing in this method ensures the most aesthetically pleasing, and durable method available. If you have areas that are difficult to reach because of tight spaces, landscaping or other impediments; we offer the perfect solution in pre made panels. Pre made panels offer the flexibility to overcome these obstacles. Pre made panels can be a more economical way to install fencing for the more budget conscious customer as well. Many of these styles can be decoratively scalloped or arched for aesthetics! Estate gates, driveway gates, roll gates, slide gates, cantilever gates. All of our gates can also be automated with gate operators for access control! We are a proud member of the American Fence Association, with one of our employees having served as the president for the association. With every wood fence installation we provide, we follow the guiding principles of this organization for best industry methods and practices. We also incorporate our decades of experience, to know what methods of installation have the best and most proven track record for Southern Florida more specifically. 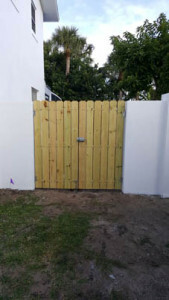 If you are looking for any type of wood fence, gate, service or repair in Palm Beach, Martin, or Broward County, Please call Budget Fence and Gate Systems at 561-793-6404.